Let's face it: we all have times when we feel like our bodies need a little extra boost; especially during the holidays. Sometimes you realize you just don't seem to have the energy you used to. Or maybe you've noticed it's harder to shed extra pounds. Or perhaps you looked in the mirror recently and suddenly saw wrinkles you didn't know you were getting. With the stresses of the holiday season, you're even more likely to feel like you've lost a bit of your edge. Whether weight gain, signs of aging, lack of energy, low libido or other issues, ProBLEN homeopathic hormone boosters can give your body the support it needs to get you back to where you want to be. People everywhere rely on ProBLEN hormone boosters to get their bodies back into balance and optimal health. We're pleased to offer an even more affordable way of stocking up and keeping a good supply of our safe, homeopathic hormone boosters: ProBLEN Create Your Own Bundle. Simply choose between two and five products to add to your bundle and receive a discount on your purchase, plus quantity discounts when you buy three or five of each. Create a recurring order for every 30, 60, or 90 days and receive an extra 10% off, as well as making sure you never run out of the boosters you love! Now is a great time to show a loved one how much you care for their well-being, or buy yourself a gift to pamper and support your body through the new year. You can learn more about our effective hormone boosters and contact us with any questions or concerns. 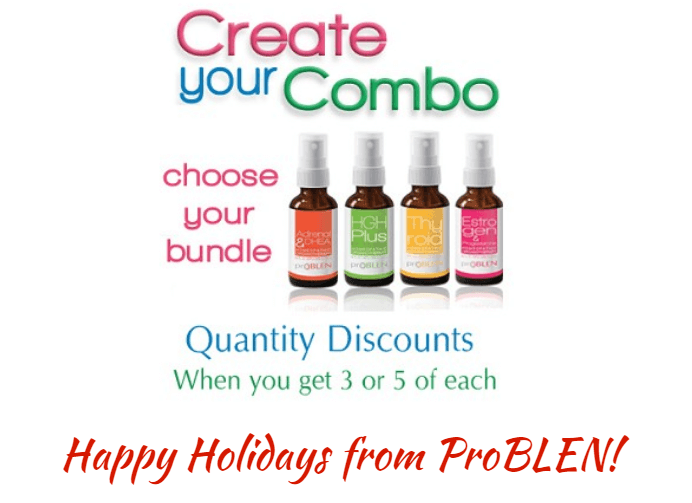 Build a complete support system for your body's hormonal balance with ProBLEN Create Your Own Bundle!